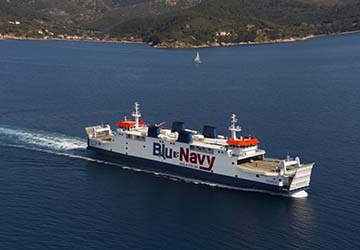 The Acciarello is a state of the art ship operating as part of the Blu Navy fleet. The vessel underwent a major refurbishment in 2015 meaning passengers will be travelling in a modern and stylish ship. It measures 113 metres in length, 18 metres wide and has the ability to embark and disembark more than 200 cars in less than half an hour. Acciarello can hold in excess of 800 passengers onboard at one time and travels at speeds reaching 16 knots. The ship comes with a number of services to help while away your time on the waves. The newly refurbished ferry comes with a new saloon bar with a large lounge, the perfect place to kick back, relax and enjoy the choice of food and drink on offer on board. There are no cabins or reserved seating options on board but a large amount of comfortable seating is situated throughout the public areas. The newly refurbished saloon bar allows travellers to enjoy food and beverages while making their tranquil Tyrrhenian crossing. The new design allows voyagers to relax with a drink in state of the art surroundings. Young travellers are able to enjoy their voyage with the on board televisions showing cartoons and kids’ shows. Colouring books are also provided for our smallest passengers. Please Note: Whilst we have taken great care in making our Acciarello guide as accurate as possible, onboard facilities, services and entertainment may vary depending on the date and time of year that you travel, facilities mentioned may change without notification and ferry companies reserve the right to operate vessels other than those mentioned at time of booking without prior notification.